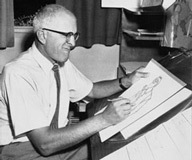 Disney Legend and animator Milt Kahl is born in San Francisco, California. Wonderland, Lady and the Tramp, Robin Hood, and The Rescuers. begins a series of performances in Indianapolis, Indiana. The Kim Possible Soundtrack, Disney's Karaoke Series: Kim Possible, Radio Disney Jams 7, and Disney's Fairy Tale Wedding Album are all released on Walt Disney Records. Disney's 50th Silly Symphony cartoon The Golden Touch (directed by Walt Disney and animated by Norm Ferguson & Fred Moore) is released. Greedy King Midas is granted his wish that everything he touches turns to gold. But his wish turns sour when everyone and everything he loves - including food - turns to gold as well! The Wonderful World of Disney presents "Disneyland Showtime," featuring The Osmond Brothers, Kurt Russell, Kids of the Kingdom, The Sound Castle, and The Dapper Dans. The new Haunted Mansion attraction (opened since August 1969) is the setting for this TV overview of the park's musical attractions. Film director, story artist and writer Nathan Greno, best known for co-directing the 2010 animated film Tangled, is born in Kenosha, Wisconsin. Meet the Robinsons, Bolt, and Tangled Ever After. the concrete will be pulverized on-site to form the base of the new Disneyland Pumbaa Parking Lot. Elton John appears on TV's The Tonight Show, promoting Disney's Broadway show Aida (which will debut in 2000), for which he has written the music. "It was a romance from the start. breakthrough in 20th Century art." In Search of the Castaways, is born in Dublin, Ireland. after being closed for refurbishment. Disney's Touchstone Pictures third release and features the music of Jerry Goldsmith. known as "Ear Force One") will officially begin an 11-week tour in Tucson, Arizona on March 30.
played the role of Capitán Monastario in the first season of Disney's Zorro. work led to voicing Goofy for eleven years in films & shorts (such as Who Framed Roger Rabbit and Sport Goofy in Soccermania), theme park rides, and TV cartoons. features Earl Holliman and Pat Crowley (as Lonnie's parents). John Riddle as Hans, and Greg Hildreth as Olaf. Sorority Boys, a comedy film directed by Wallace Wolodarsky, about a group of college boys who dress up as girls in order to prove their innocence for a crime they did not commit, is released by Touchstone Pictures. Starring Barry Watson, Michael Rosenbaum, and Harland Williams, it is distributed by Buena Vista Pictures. Nonnie Parker in the 1993 film A Far Off Place and Mrs. Whatsit in the 2018 feature A Wrinkle in Time.